Bournemouth University graduates were celebrating last night as their work on the film Gravity was highlighted with an Oscar win. Graduates and lecturers from BU’s National Centre for Computer Animation (NCCA) were part of the team that worked on the visual effects for the blockbuster. Gravity picked up the Oscar for Achievement in Visual Effects at an eventful awards ceremony in Hollywood, Los Angeles hosted by Ellen DeGeneres. The film picked up a total of seven Oscars on the night, including nods for Best Director (Alfonso Cuarón), Achievement in Cinematography and Achievement in Film Editing. 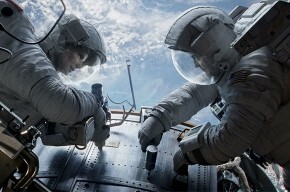 The movie, which also picked up high-profile awards at this year’s BAFTAs, stars George Clooney and Sandra Bullock, but the majority of the space-themed film was created digitally. London-based effects house Framestore worked on the special effects for the film – with the help of around 60 alumni from BU’s animation and visual effects courses. Adam Redford, a Senior Practice Fellow in Computer Animation at BU, was a senior texture artist at Framestore. He worked for around six months on the film, helping to paint some of the interior and exterior sets and props seen in the film. Anna Swift, Recruitment & Talent Development Manager at Framestore, said, “We are so thrilled to be celebrating Gravity’s success, which is a testament to the commitment and skill of our talented staff, including Bournemouth University graduates”. It is not the first time that NCCA alumni have had their work recognised with high-profile awards. More than 50 graduates and former BU academics worked on the Oscar-winning visual effects for Avatar, while MA Visual Effects graduate Andy Lockley won an Oscar in 2011 for his work on the special effects for Inception. The NCCA’s contribution to world-leading excellence and pioneering development in computer animation was even recognised with a Queen’s Anniversary Prize in 2012.